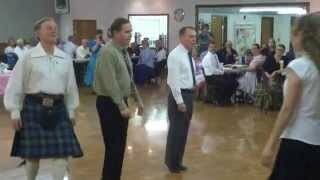 Scottish dance friends had fun with Shiftin Bobbins music during a demo. Lead down the middle and up has the rare quality to cross 8-bar phrases. The spirit of the dance compelled us to respond with Hey! We closed the demo with a Square Dance tradition to thank the set for dancing. 1c dance to top, cast off one ; ½ Fig8 up round 2c.